A HISTORY OF ROCKINGHAM COUNTY, VA.
by John W. Wayland, Ph. D.
Settlement of the county began in 1727, when Adam Miller (Mueller) staked out a claim on the south fork of the Shenandoah River, near the line that now divides Rockingham County from Page County. On a trip through eastern Virginia, the German-born Miller had heard reports about a lush valley to the west which had been discovered by Governor Alexander Spotswood's legendary Knights of the Golden Horseshoe Expedition, and then moved his family down from Lancaster County, Pennsylvania. In 1741, Miller purchased 820 acres (3.3 km2), including a large lithia spring, near Elkton, Virginia, and lived on this property for the remainder of his life. Much-increased settlement of this portion of the Colony of Virginia by Europeans began in the 1740s and 1750s. Standing between the Tidewater and Piedmont regions to the east in Virginia and the Shenandoah Valley and the area beyond (known in old Virginia as the "Transmountaine") were the Blue Ridge Mountains. Rather than cross such a formidable physical barrier, most early settlers came southerly up the valley across the Potomac River from Maryland and Pennsylvania. Many followed the Great Wagon Trail, also known as the Valley Pike (U.S. Route 11 in modern times). Rockingham County was established in 1778 from Augusta County. Harrisonburg was named as the county seat and incorporated as a town in 1780. 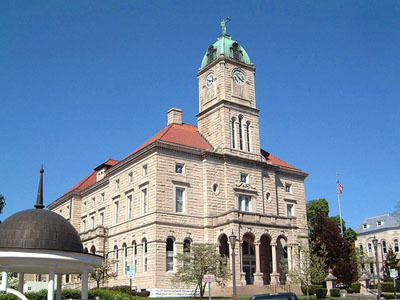 Harrisonburg was incorporated as a city in 1916 and separated from Rockingham County (all cities in Virginia are independent cities), but it remains the county seat. The county is named for Charles Watson-Wentworth, 2nd Marquess of Rockingham, a British statesman (1730–1782). He was Prime Minister of Great Britain twice, and a keen supporter of constitutional rights for the colonists. During his first term, he repealed the Stamp Act of 1765, reducing the tax burden on the colonies. Appointed again in 1782, upon taking office, he backed the claim for the independence of the Thirteen Colonies, initiating an end to British involvement in the American Revolutionary War. However, he died after only 14 weeks in office. By 1778, it was unusual to honor British officials in Virginia, fighting for its independence. The same year, immediately to the north of Rockingham County, Dunmore County, named for Virginia's last Royal Governor, John Murray, 4th Earl of Dunmore, an unpopular figure, was renamed. The new name, Shenandoah County, used a Native American name. However, long their political supporter in the British Parliament, the Marquess of Rockingham was a popular figure with the citizens of the new United States. Also named in his honor were Rockingham County, New Hampshire, Rockingham County, North Carolina, and the City of Rockingham in Richmond County, North Carolina. Rockingham County is the birthplace of Thomas Lincoln, Abraham Lincoln’s father.